An IMF head without ties to Europe would perhaps be able to advocate for the best solution, no matter how painful. NEW YORK ( TheStreet) -- One blog called it a "Battle Royale," as Christine Lagarde, France's Finance Minister, announced her candidacy for the IMF's top job. That job has always been held by a European. But the heads of the emerging economies believe that they are the engine of the world's future economic growth, a very strong and convincing argument. Yet, the most pressing issue for the IMF, and, many, including myself, believe for the world, is the European debt crisis. Europe's financial system could very well collapse if a Greek default is followed by a default from Ireland, Portugal or Spain. This could easily trigger another worldwide financial panic if foreign financial institutions behave like they did in the 2009 crisis and refuse to provide liquidity to their brethren. Worse, any default could very well trigger a crisis that goes well beyond the banking system if the collection of bets on credit default swaps (CDS) causes liquidity and solvency problems with the issuing institutions. Because CDS are not well regulated, we simply do not know what risk they carry in a financial meltdown. It seems then that managing Europe's debt crisis to the best of a bad lot of solutions is the most important financial issue facing the world today. There is an underlying assumption that a European, like Lagarde, would be best suited to head the IMF in such an environment because only a European would be in a position to completely understand and address the problem. I question this assumption. The French and German banks face liquidity and possible solvency issues if Greece defaults and dominos begin to fall. Will the former French Finance Minister be able to make decisions that carry heavy short-term pain for European banks and economies if that is the best long-term solution? Or will she advocate continuing to treat this as a liquidity crisis (which it is not -- it is a solvency crisis) and kick the can further down the road like the IMF and ECB did a year ago with the original Greek debt crisis? Perhaps a new approach would be best in the long-run. Perhaps an IMF head without ties to Europe would be able to advocate for the best solution, no matter how painful. 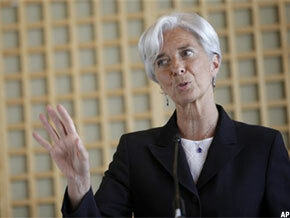 While she has financial credentials, Lagarde is first and foremost a consummate politician. I doubt she would have announced her candidacy without first enlisting support and assessing that she is the odds on favorite. While the emerging nations have a very strong argument for their position, they are not united on a candidate. Within their own group, they appear to be regionalized. Mexico's candidate, Agustin Carstens, would appear to have Western Hemisphere support. Russia has put forth its own candidate, Gregory Marchenko. The table below shows IMF voting percentages by country. I have divided the table into three sections: those likely to support Lagarde, those likely to support Carstens, and unknown. Conspicuously, I have put the U.S., with the largest vote (16.74%) into the "unknown" column. Like it has done so often since its assumption of power, the Obama administration is non-committal, waiting to see which way the wind is blowing (Geithner: Both Lagarde and Carstens are "credible"). You can see from the table that the wind is clearly at Lagarde's back. She likely has 30% of the vote right out of the box with Carsten's a long shot with only 4%. If we take the U.S. out of the analysis, she only needs 42% of the remaining vote (i.e., without the U.S.) to win. I suspect that, as the U.S. assesses the wind, it will align with her. As a result, over the next few months, if she is the IMF's new head, as seems inevitable, the solution to Europe's debt crisis is likely to be more of the same: treat the crisis as a liquidity crisis instead of the solvency crisis that it is, kick the can further down the road, and hope for a miracle.